When it rains it pours they say, Carmelo was recently suspended after a supposed incident between him and Celtics player Kevin Garnett. I guess Carmelo wanted to put them paws on him for the game and disrespecting his wife. 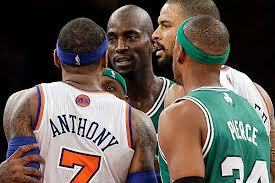 Allegedly the Kevin Garnett made comments to " His wife tasting like Honey Nut cheerios". IDk that sounds like grounds for a beat down, but hey the NBA didn't feel the same. The two teams have a rematch game in Boston in a couple weeks. To add to this drama the rumor mill is that Carmelo and his wife were going through a separation. My two cents I like them as a couple and she is in NY by her husbands side so that speaks numbers. Anyway leave a comment let me know your two cents.